#4 In football, just as in business, there is a very real need to be shrewd about how dollars get spent. Words to live by that in the end will help small business save our economy. #8 You don’t make a big deal out of the mistakes you save that energy to celebrate the successes. If only I could get my clients to focus on the next success they would be happier and I would be happier! #9 You need to be in charge of your own confidence. Confidence makes all the difference in ultimate success or failure and too few people see this, choosing instead to undermine their own successes with their own doubts. Knowing your strengths goes has in hand with finding your ultimate source of confidence. #20 How do we cultivate our own instincts? We listen to our won inner voice. Listening always wins out talking for insight into anything. #25 If you want to increase your work load, hire an assistant. And you do want to increase your capacity to get things done – there just isn’t time enough in a lifetime. #52 Anything is possible when human beings are committed and passionate and determined to fight. Words to live by as we go through look for reasons to not only live but thrive everyday. Read and enjoy Ms. Donaldson’s lighthearted but profound stories. Even a non-devoted football lightweight like me found them inspirational and fun. Armchair Interviews says: This is a 5-start read. 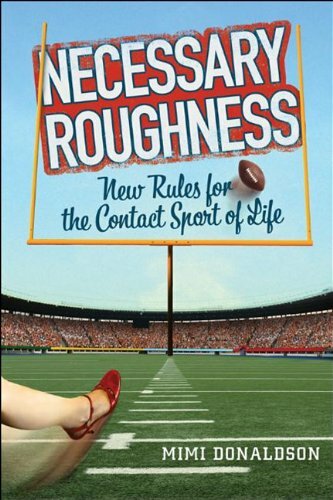 I sent this book immediately to my college-age son for him to contemplate during football season and as he finishes his junior year in college!